Mini piqué. Fitted style. Contrast tipped flat knit collar and cuffs with Lycra®. Taped neck. Five s..
Fitted cut. Contrast tipping on ribbed knit collar and cuffs. Taped neck. Narrow four self colour bu..
Ladies fit. Contrast stripes under collar. Reinforced narrow three pearlised button placket. Contras..
Ladies fit. 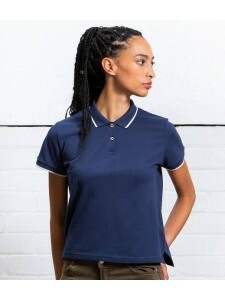 Ribbed collar and cuffs with contrast double stripe tipping. Taped neck. Three self colo..
Micro piqué. Ribbed collar and cuffs with contrast tipping. Taped neck. Narrow two button placket wi.. Taped neck. Three button placket with contrast inner. Raglan style with piping on shoulders and slee.. Slim fit. Flat knit collar. Contrast taped neck. Three button placket. Sewn diagonal stripe. Solid c..
Self fabric collar. Contrast fabric collar stand. Taped neck. Contrast woven inner placket and inner..
Classic fit. Contrast taped neck. Back yoke. Three pearl effect button placket. Contrast inner plack..